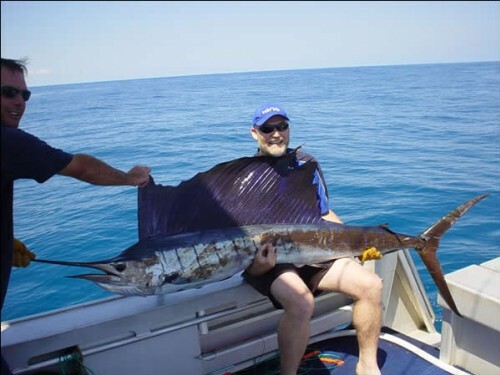 Come and Fish the aqua waters of Broome aboard our Custom 40′ Game Fishing boat Billistica. Why would you miss Game Fishing for majestic Sailfish or Marlin as they dance over the cobalt blue waters of the Indian Ocean? Game Fishing for Sailfish, Marlin etc onboard Billistic is done by switch baiting off teasers. On board we use Billfish foundation approved circle hooks and this has increased hook ups and dramatically reduced injury to the Sailfish, Billfish, Marlin, etc. 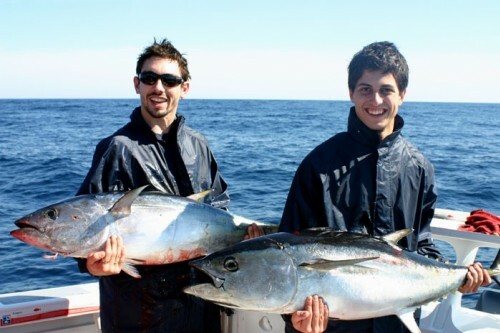 In addition to Sailfish, the waters around Broome offer some speed demons such as Spanish Mackerel, Cobia, Northern Bluefin Tuna, and if you are very lucky Spearfish. The vessel was designed & built in Broome and launched in Jun ’03. Billistic was custom built for Sailfishing here and is powered with Twin 240HP Yanmar Diesels. 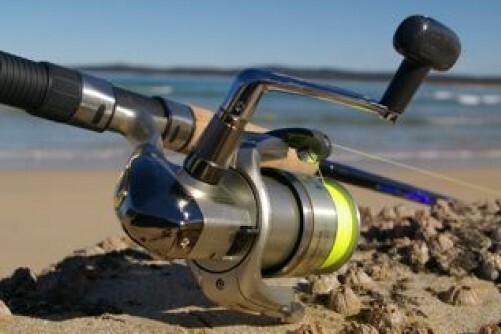 It has a 360° walk around configuration thus giving you an extra advantage in multiple hook ups. Along with this is a helm station upstairs which gives great visibility and visuals of the Sailfish and Marlin.The cabin area has excellent shade and comfortable seating with a flushing toilet downstairs. The Broome fishing grounds vary in distance off shore depending on the time of year so given that Billistic has a top speed of 37 knorts and can cruise at 22 to 24 knots – the fishing grounds are not so far away. We advise you to contact us for the ideal moon/tide combination as Broome has some of the largest tides in the world (up to10m), thus giving you the best chance of catching that elusive Sailfish. Chris the owner/skipper of Billistic and Ben, number one deckhand will be more than happy to give you a few fishing tips and hints, they can show you everything from how to plat a double, run your teasers or how to rig a skipping garfish. Sailfish have a great habit of hunting in packs or pods as they’re called, so you will need to help clearing the water & deck of up to 4 teasers before reversing up on a Sailfish/Marlin. Accommodation is often at a premium in Broome between May to September. We have provided a list of venues which features all levels of accommodation to suite all budgets. We recommend that you confirm your accommodation before booking with us. Inclusions: Fishing gear, lunch, nibbles, soft drink, sun tan cream and a deck hand. Alcohol not included. Broome Billfish Charters designed its own Game fishing boat, which was built in Broome by Ocean Pearl Boat Builders and owned by Rod Wellington. Billistic is a 2C 8×2 survey and has been constructed to meet conditions for both Broome barmy climate and waters. She was launched in June 2003 and was designed primarily for Sailfishing in light to medium seas. She is 40′ overall and has a 3.6m beam and 360° walk around configuration. On top is a 5m tower complete with Morse electronic controls etc. Billistic is powered by Twin 240HP Yanmar diesels engines which gives her a top end speed of around 37 knots and cruise speed of 24. Billistic has a Billistic so as not to compromise top end speed or stability of the vessel with customers and extra fuel. The cabin area has planety of shade and comfortable seating with a fridge freezer for drinks. Downstairs has a flushing toilet. Billistic has been designed as a fishing platform to catch Sailfish, so where it misses out on the extra’s it makes up on with fishability and speed to get to the fishing grounds. If you’ve never been Game fishing and are concerned you might not be up to it¬ don’t be. Many of my customers are first timers and have a great time. Expect to be involved and get a few seasoned tips as well. 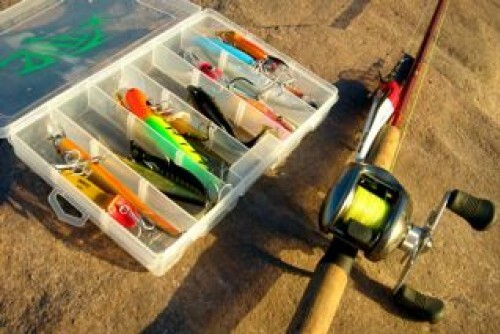 Unfortunately we can’t guarantee you fish, but I will do my best to get you hooked up.